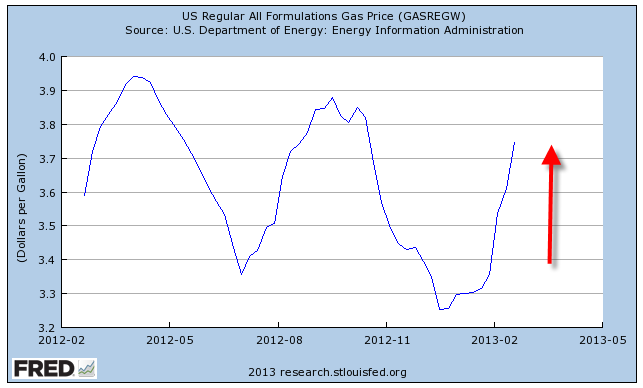 Most of us with cars have noticed the rather dramatic increase in gas prices since the beginning of the year. 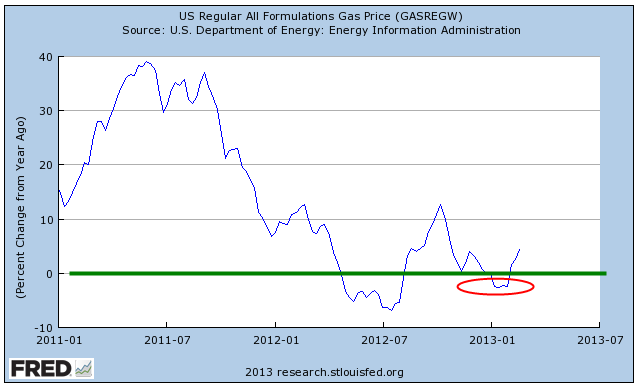 I’ll use the all formulations series, which is about 8 – 10 cents cheaper than what a family might pay at the pump. A reason given for the upsurge in prices is that this is a normal seasonal change as refineries shut down to make the change over from a winter gas formulation to a summer gas formulation. Heavier volatile organic compounds are removed from gas during the summer months to reduce smog. The resultant decrease in supply therefore leads to an increase in price. It’s Econ 101. If that were true, then the year-over-year percent change would be relatively minor at this time of year. In one of those contradictory anomalies, this year is the only year that the refinery change-over explanation actually fits. Price changes over the same months in 2012 have been minor. 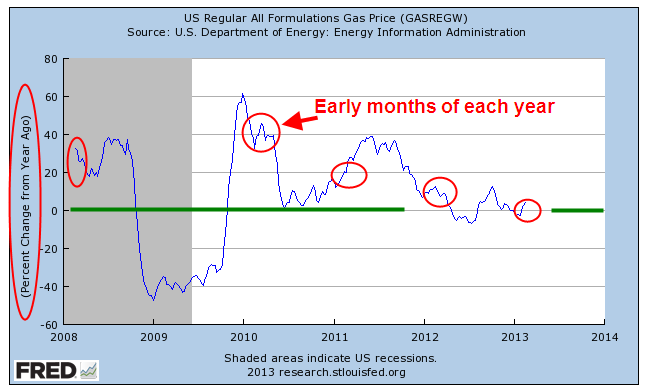 Notice that in other years, price increases in the early months contradicted the theory. The change has been particularly noticeable because gas prices decreased to near $3 a gallon toward the end of 2012. In the Denver area, prices dropped below $3 a gallon, prompting comments in idle conversation. The average driver uses about 10 gallons a week but out west, where driving distances are greater, that average gas consumption is probably closer to 15 – 17 gallons. The difference between $3 gas and $4 gas can mean a weekly gas “tax” of $15 or more. For those of us who use a vehicle for work, the difference can be $30 or more. 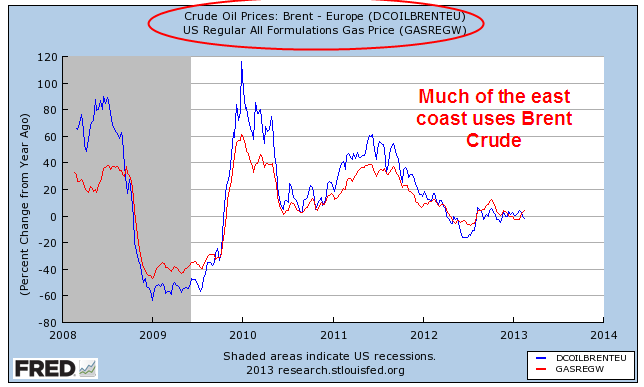 However, since the late nineties average gas prices are rising and have become quite volatile. So why? Our gasoline use was increasing during the nineties but prices were flat at a little over a $1 a gallon. Why the big increase in the past 10 – 15 years? 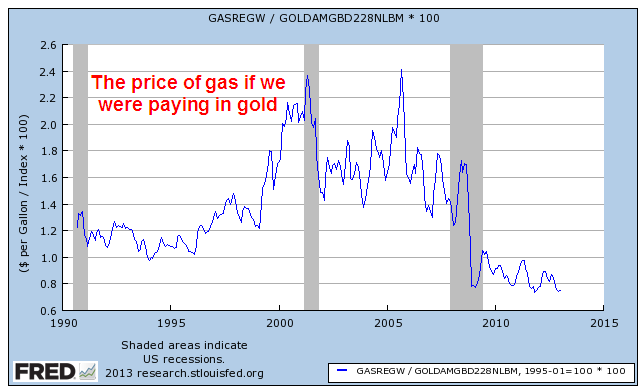 If one were buying gasoline with gold, the price has fallen over the past two decades. If our consumption has levelled off in the past few years and we are producing more oil in this country, why has the price of gasoline stayed pretty consistently above $3 a gallon? The three main variations of crude oil are heavy (Venezuela, for example), medium (North Sea and MidEast) and light (Texas). The benchmark for medium grade is Brent Crude; for light grade it is West Texas Intermediate (WTI). 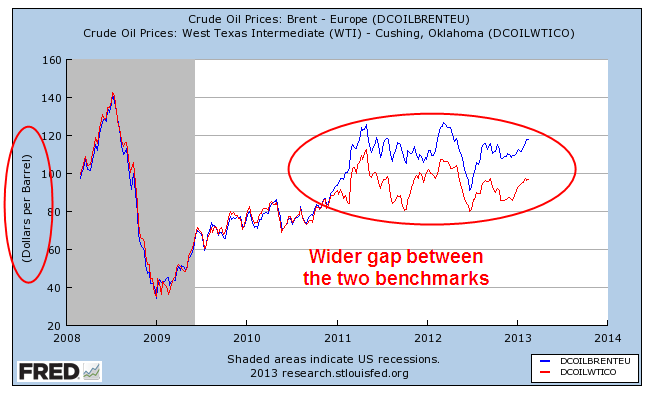 The two benchmarks have traditionally moved in tandem with Brent Crude trading about $2 above WTI. Over the past few years, the difference in price between the two benchmarks has widened considerably. “Fracking” has led to an upsurge in domestic production; production in the North Sea has been steadily declining; tensions in the MidEast and North Africa have contributed a risk premium to medium crude produced in the region. Refineries are set up to process a particular type. Most east coast refineries process Brent Crude; higher transportation costs of domestically produced crude oil over land made it more cost efficient for eastern refineries to import oil from overseas. Since the majority of the U.S. population lives in the eastern U.S., the majority of the American people use imported gas. Gas prices move in tandem with the spot price of Brent crude. 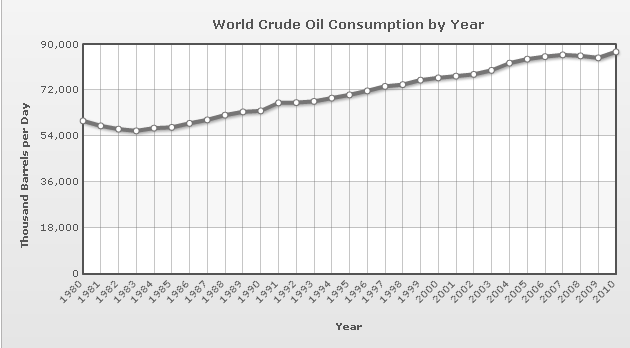 While U.S. oil consumption has declined, world consumption has been rising. 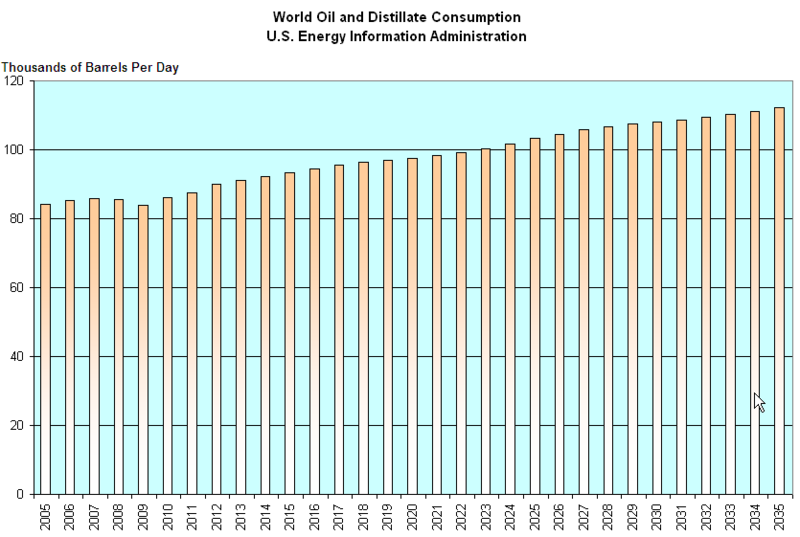 The U.S. Energy Information Administration projects a slow, steady rise in oil consumption over the next two decades as the standard of living improves. No magic wand will cause gas prices to decline. Crude oil and its derivative products are a world commodity and can be shipped inexpensively in large tankers all around the world. Last week I wrote about the long term trend in federal debt; that it was not a “New Normal” but a continuation of the same old normal of the past several decades. The continued rise in oil prices is another trend that has become a fixture of our daily lives and will continue to eat at the dollars in our pocketbooks for the foreseeable future.